Yesterday, at the IFA Berlin, Armin van Buuren announced a collaboration with Philips. Together, they’ve launched the M1X-DJ System, which allows anyone who wants to mix, play and share their music to do so on one portable device. The system is simple to use and provides an authentic DJ experience for beginners to professionals, depending on how you choose to use the features. With multiple inputs and outputs, aspiring artists can link up multiple M1X-DJs or bigger stereo systems for a more club-like sound. Bluetooth connectivity allows you to share your favourite music from Bluetooth-enabled devices. 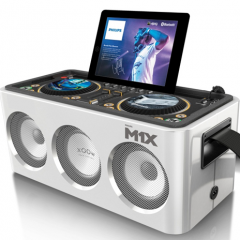 When the party moves outside or to a remote location that may not have accessible power, the M1X-DJ will play for five hours with D cell batteries. The Philips M1X-DJ Sound System will be available in November 2013.